The Twilight movies, and the books they're based on, are so bad they're almost beyond criticism. The writer has taken a half-baked sexual fantasy, embellished it with cardboard characters and bowdlerized aeons of mythology. Not to mention the movie promotes a relationship dynamic that would make some paleoconservatives blush. So why review this at all? If this was forgotten instead of just forgettable, I wouldn't bother. But because it's so popular, I think this movie deserves a close viewing. If only to understand its evil, boring power. The series's disturbing lack of imagination is reflected in the character's sartorial sense. I'm not disparaging Wendy Chuck (the film's costume designer). I think she did a good job with the material she had to work with. It's a shame the material is so poor. Forks, Washington, population 3,120, is shrouded in clouds and rain. Evidently half of its population are high school students, given the school's size. It is also near a Quileute Indian reservation. 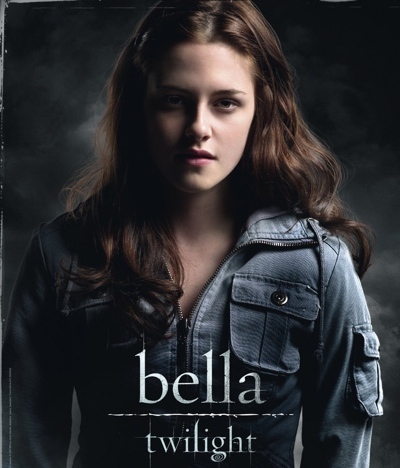 Enter Isabella Swan, a girl with no discernible personality traits. She's come from Phoenix, Arizona to live with her dad, a Forks cop. She has no hobbies, no extracurricular involvements, no obvious ambitions. Isabella is the protagonist. Bella's outfits are classic tomboy. She always wears pants, save at prom. She often wears her hair in a ponytail, or tucked into a plain black headband. After she starts falling for Cullen, her outfits become a bit more feminine, and we see more embroidered sweaters, more revealing shirts, and more makeup on her face. Bella wears earth tones, mostly browns, greens and grays. These colors, combined with the lighting, make her look sickly pale. Is that the point? Swan's clothing is modest; her legs are always covered, her arms almost always, and we never see any leg or midriff. Even at prom, she wears a long-sleeved sweater over her dress. 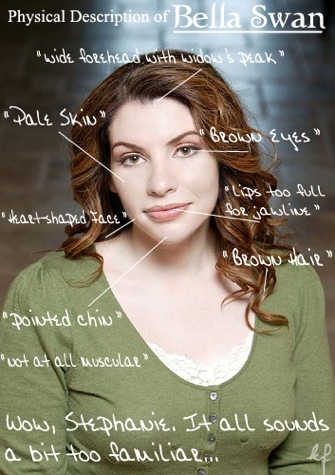 In the Twilight book series, Bella is described as looking exactly like Stephenie Meyer, the series's writer. Her Mary Sue qualities support this hypothesis, although that makes the series even more disturbing. Charlie, Bella's father, is either in his cop uniform or a flannel shirt and old blue jeans. An average Joe, in other words. Either he's on duty, or he's watching the game and drinking a six pack. Jacob Black, and his father Billy, are two Quileute Indians who live on a nearby reservation. They keep it casual in dark pullovers and jeans. Jacob is, of course, a werewolf, but neither he nor his father get much screen time in this film, and we are spared the unconvincing CGI dogs. This must be one of the few teen movies that doesn't emphasize clique dynamics. 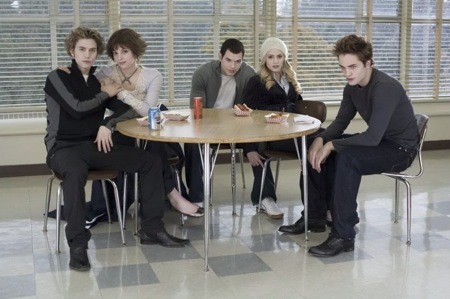 It seems there are no cliques at Forks High, or none of note. Perhaps, in a town whose population is just under 3,500, there aren't enough kids to create a real pecking order. Or perhaps the writers just got lazy. Who knows. Her name is Jessica Stanley. Stanley is an aspiring popular girl who can't quite enter the inner sanctum, if there is one. Either she isn't pretty enough, wealthy enough, or lacks that x factor that inspires worship. Anna Kendrick is the perfect actress for this role. Unfortunately, the movie doesn't have enough imagination to do anything interesting with her character. Or any of the characters, for that matter. Stanley's most consistent accessory is a brown headband. Her clothes are brown and pink, usually with some gold necklace thrown in. We rarely see her lower half, save a brief scene in the school gymnasium, so who knows if she wears skirts or pants? Given the local climate, I'm guessing pants. Often she wears a tank top under a sweater, cardigan or puffy vest. In one scene, she and vaguely-artistic girl take Bella with them shopping for prom dresses. Since Bella "isn't going to prom" she uses this as an excuse to stare out the window and act totally disinterested. Wow, what a friend! These prom dresses are regular, middle-class prom dresses, complete with too-shiny fabric and ill-fitting midsections. They are not the fabulous, Oscar-worthy designer gowns you see in some teen movies. Wendy Chuck, the costume designer, apparently bought very little high-end clothing for the film, since they wanted to give Forks a realistic small town feel. Call me weird, but I thought that the "real" high school students were the most interesting characters in this film. They have little to do, aside from adoring Bella for no reason. But they have lives, lives that extend beyond their own navels. We see them going to the beach, working on the newspaper, hanging out, and all the time Bella acts like it's a big chore to accompany them, instead of obsessing over herself and the pure, perfect love of her life. Now let's turn to the Cullens. In order to subvert the gothic reputation of vampires, costume designer Wendy Chuck avoided using black clothing. Instead, they wear whites, grays, blues and near-blacks. These colors are meant to convey death and coldness, as is their makeup. 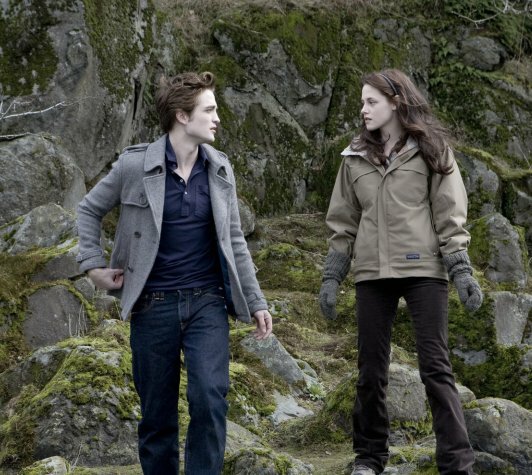 Edward Cullen, Bella's love interest, dresses in the same icy tones as the rest of the Cullens. According to Chuck, these clothes were chosen to be "pale and cold," without being gothic. The clothing was cut to look like an updated version of an Edwardian gentleman's outfit. One of Edward's signature items of clothing is a double breasted peacoat, with long, loosely-folded lapels and shoulder straps. This was custom-made for the film. Watching the movie with this quote in mind makes it much more entertaining. It also adds another layer to some pretty inane dialogue. This "manic-depressive who hates himself" is far from being the perfect, beautiful, perfect man the author wants him to be; instead, he comes across as an abusive boyfriend in training. In her Sparkledammerung, Karma Laundrette pointed out that Edward Cullen's description mirrors how Mormons describe Joseph Smith, Mormonism's main prophet. "[Stephenie Meyer] was drawing from everything we Mormons were taught about Good Ol' Joe," Laundrette wrote. "he was handsome, shockingly so, he could draw you in with just his presence, let alone when he spoke, down to his freaking nose and hair color." An article on lds.org confirms Laundrette's assertion. Mr. Smith is described as being quite pale, with light brown, "almost blond" hair, handsome features, a broad chest, a forehead "white, without a furrow," and "temperament evidently sanguine" (emphasis mine). Does Ms. Meyer want to "bone her prophet," as Laundrette put it? I don't know, nor do I want to, but Mary Sue/Joseph Smith fanslash is a lot more entertaining. The antagonists in this film are a trio of human-eating vampires: James, Laurent and Victoria. They scavenge their clothing from their victims, leading to a sort of Goodwill/rock and roll aesthetic. In one scene, Victoria wears a shirt saying "Kiss Me, I'm Irish," which is earlier seen on one of her victims. Laurent has long dreadlocks and some ambiguously Carribean accent. With the noticeable exception of James, who wears a brown leather jacket, the others wear layered tops over dark pants. 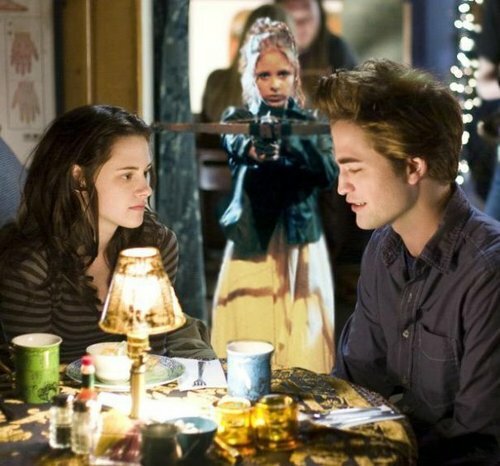 These vampires are "just passing through" until James gets a whiff of Bella's hair. For no reason at all, James decides to chase after Bella and attack her, even though she's protected by an entire family of vampires. He travels from Washington to Arizona in pursuit of her. Maybe he really wants Bella's shoes? Twilight has made some people a lot of money. It has also, probably, typecast Robert Pattinson for the foreseeable future. But does it offer anything of value? In the last analysis, I don't think so. There are plenty of good teen supernatural films, like Ginger Snaps , Powder and Carrie . Save your money and rent one of these instead.